Koh Mak, an island to the south of Koh Chang, is definitely worth a visit if you plan on exploring this part of Thailand during your holiday. It is a mid-size island which is becoming increasingly popular with couples and families due to its deserted beaches and lack beer bars and ugly concrete block hotels. It’s a haven for people who want to avoid the bright lights and over development of larger islands but still want more than just a basic beach hut. Over 10 years ago, The Sunday Times chose Koh Mak as one of their Top Undiscovered Islands and just a couple of years ago the New York Times ran an article on finding ‘Old Thailand’ on Koh Mak. Koh Mak is a relatively small, island, far more the typical desert island model than the mountainous Koh Chang and Koh Kood. It lies approximately 20 kilometres south of Koh Chang and covers an area of 16 square kilometres. It’s roughly 10km wide and 5km from north to south. So it’s too big to walk around, but easy to see by bicycle or scooter. Bicycles are fast becoming the preferred means of travel on the island. In part due to the lack of hills and relatively short distances but also because there isn’t a car ferry to Koh Mak. So there’s very little traffic on the island. And as most development is limited to the western side of the island, no matter where you stay you are usually within a walking or cycling distance of wherever you want to go . . . which is just as well as you can’t expect much in the way of public transport. Although there are a couple of pick up truck taxis on the island now which charge 50 Baht/person pretty much regardless of where you want to go. There aren’t any rivers on Koh Mak, therefore it’s a very arid island which also lacks the jungle clad mountains of Koh Chang and Koh Kood. So it has a different vibe. It is a still a working island covered predominantly by coconut groves and rubber plantations which account for 90% of the scenery on the island. On the plus side the quiet concrete and dirt roads are very shady and it’s an island that’s ideal to explore by mountain bike. There are 2 villages on Koh Mak, ‘Baan Ao Nid’ on the Southeastern coast is home to around 50 families plus the island’s school, temple and clinic and ‘Ban Laem Son’ which lies in the northwest corner of the island away from virtually all of the tourist development. Elsewhere you will find small hamlets of a few homes clustered in areas on the eastern shores. The details below are for High Season. During the rainy season, June – September, not all services run, although you can still get to the island from the mainland. Boats from Koh Chang to Koh Mak don’t operate from June-September. These boat are all speedboats. The ticket price is the same for all boats. 450 Baht per person one way. 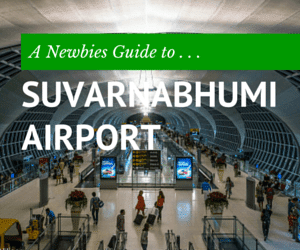 Children under 130cm are 300 Baht and toddlers and babies under 90cm are free. Buy tickets at the mainland pier or your resort when you are on Koh Mak. All boats depart from Krom Luang pier, Laem Ngop on the mainland. Leelawadee uses Makathanee Resort pier. Panan uses Koh Mak Resort pier. Seatales and Suansuk use Ao Nid pier. In 2010 a new speedboat service from Kai Bae to Koh Mak was launched, departures at 0900 and 1200. Price 600 Baht. For many people on the west coast this is a preferable service to departing from Bangbao as it saves a pick up truck ride along narrow steep road and you also get to see the west coast of Koh Chang from the sea. If you want to book this just buy tickets for the Kai Bae Hut Speedboat from any tour agent. 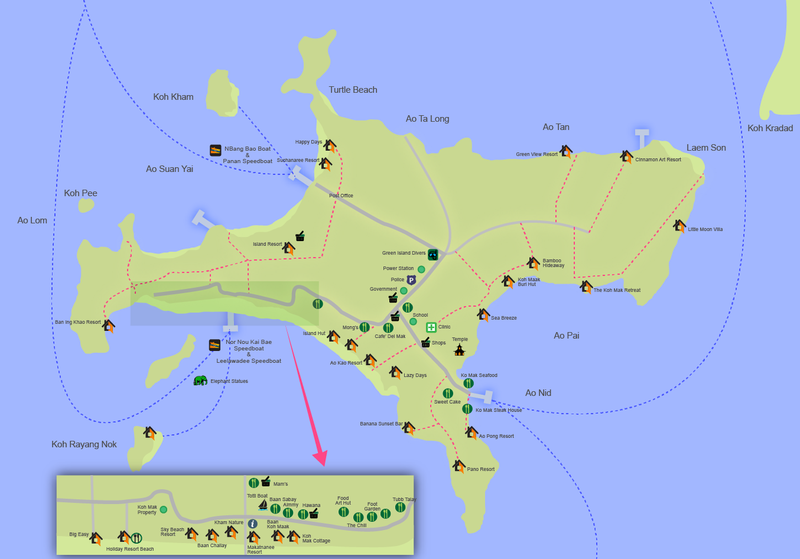 Detailed map of resorts, restaurants on Koh Mak island, Trat, Thailand. As you can see from the above map pretty much all the resorts lie on one of the two main beaches. But as most resorts are relatively small and there is plenty of undeveloped beachfront land, you’re in no danger of feeling as though you are on a busy, touristy island even in peak season. And it is still easy to wander off and find a few hundred metres of beach to yourself. In the northwest of the island, Suan Yai Beach, offers sun worshipper’s the chance to toast themselves along a 2 kilometre stretch of white sand beach. For a good photo opportunity, head up the ridge at the western end of the beach, to Thaidaho Vista. Here you can enjoy an amazing, panoramic along the length of the beach and north towards Koh Wai and Koh Chang. From Koh Mak Vista it’s only 5 minutes walk to the southwestern shore of the island where you’ll find Ao Kao beach, the northern stretch of which is the most developed area on the island which small resorts lining the beach and an increasing number of small cafes and restaurants on the main road which runs along the rear of the resorts. This is the busiest area of the island and it is where many visitors head for dinner or a laid back night out. Note that there aren’t any ATMs or banks on the island. Although large resorts will give cash advances on credit cards for a small commission. This Googlemap will help you get your bearings. Zoom in and click the icons for more information. Located on the east, Ao Nid Pier is the main cargo pier and has good views south to Koh Kood. From the pier, a paved road leads to the centre of the island and then branches off to the various beaches. There is a good coffee and cake shop on the hill above the pier. Nearby is Wat Samakkeetham, Buddhist temple which also overlooks the bay and is open to all. Highlights include a huge tree and if you look at the standing Buddha statues you’ll notice that the images have definite feminine curves and features – in tribute to the founder of the temple, the mother, and grandmother, of many of the island’s current resort owners, who donated the money to build it. At Koh Mak Seafood, by the shore below the pier, the owner has put together a small collection of old photos and artifacts which give you an insight into the history of Koh Mak. He will be happy to talk you though it. 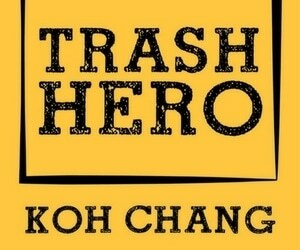 A far different history to Koh Chang’s. Adjacent to Ao Nid Pier, another long beach but one with red sand and stones. Nice to walk on with great views of Koh Kood but not ideal for swimming. An area of pine trees in the north east of the island with good views to the nearby island of Koh Kradad. This is a good area for fishing. You can also usually find a guy with a longtail boat who will take you over to Koh Kradad for the day. If not, Little Moon Villas, nearby, offer the service for 350 Baht/person round trip. Koh Mak has been receiving foreign tourists for far longer than you might think. The first groups of German visitors stayed in the early 1970s. This was a result of members of the family that still own most of the island sending their kids to study in Europe. But the islanders have never tried to push for development and so it has increased gradually over the years. Today, as you’ll see in the video from April 2017, it’s still as laid back as ever. Koh Kham Resort used to be a popular spot to stay, with only one small budget bungalow resort on the private island. However, the island was sold and it was being developed into a 6 star luxury retreat for the rich. However, work ground to a halt several years ago. Staff still tend the island and sweep the powdery, white sand beach daily. Also just off the northwest coast, Koh Pee is a very small island – more a very large rock than anything else. There isn’t much to see above water but it is a great spot to snorkel. Rent a canoe from Cococape Resort and paddle here. Just off the western end of Ao Kao Beach you’ll see these two small islands. There’s nothing to see on Koh Rayang Nai, which is the closest to Koh Mak ( at very low tide you can walk to the island ) except one shrine in memory of one of the founders of the island. Koh Rayang, on the other hand is home to a small resort ‘Rayang Island Resort’ that caters to people wanting to get away for a while and enjoy the simple life. There’s a lovely little beach with good snorkelling and peace and quiet. Daytrippers are also welcome, but as with Koh Kham there’s a small admission fee, which includes a free soft drink. Simple meals are available in the restaurant. Another, larger, private island just off the northeast cost of Koh Mak. It’s flat and featureless. But is home to a herd of deer and has a few kilometres of white sand beach along the east coast. Also a small restaurant and three fan huts that cater to the few tourists who stay there. Although there are now over 30 places on the island, most are relatively bungalow resorts. The only hotel style accommodation is in the block at Makathanee Resort and also at Islanda Resort, which overlooks Ao Suan Yai. You’ll find the best value accommodation and that in prime locations often fill up quickly in High Season. But despite this, it is usually possible to find accommodation if you just arrive on the island without a booking. Of course, it’s best to have done some research in advance and selected a handful of places you would like to stay. Ao Suan Yai, the north facing beach has, for most of the year, the calmest sea. It is dominated by Koh Mak Resort, the largest on the island . This has a variety of air-con bungalows stretched out along 400 metres of beachfront. Adjacent is the more upmarket, Seavana Resort, which is run by the son of the owner of Koh Mak Resort. It’s a much more modern, stylish place with a more youthful approach to running the business and taking care of guests. 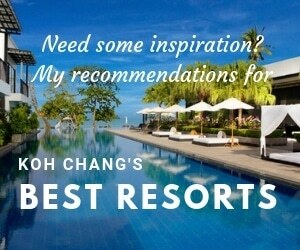 Overall, it’s the island’s best beachfront resort. If it’s a bit pricey and you prefer a small beachfront resort with simple fan and AC bungalows, then Happy Days which is 10 minutes walk north along the beach should fit the bill. It is situated adjacent to the ‘old house’. A teak wood villa which is the oldest building on the island. If you don’t mind staying 5 minutes walk from the beach then you should check out Thaidaho Vista, a 5 room guesthouse on the ridge overlooking the bay. Stunning views and great service fro the friendly Thai / American owners. For anyone travelling with a family or in need of more space, you’ll find houses for rent , which are ideal for families located in the grounds of Goodtime Resort. Book direct with the owners, rather than through the resort, to get the best rates. You’ll find Pickle House, Coconut House and several more listed on Airbnb. Moving south to Ao Kao beach. Popular bungalow resorts include Big Easy and Koh Mak Holiday, both towards the western end of the beach. The backpacker friendly Monkey Island, right in the centre of the beach. This is the main spot on the island for a night out or beach party and live music. And towards the eastern end there’s the long-established Ao Kao Resort, one of the first resorts on the island which provides a lot of activities and facilities for families and kids. Also on the same shore, but on a rocky shoreline, lie Banana Sunset, a great little cocktail bar with a handful of huts and Pano Resort which is a great spot to get away from it all. The small beaches on the east coast of the island are home to a couple of upmarket resorts, Plubpla Retreat and Little Moon Villa. Both are a bit remote, you won’t be walking to any shops. But if you just want to get away from it all then they’re ideal spots to escape from the real world for a few days. 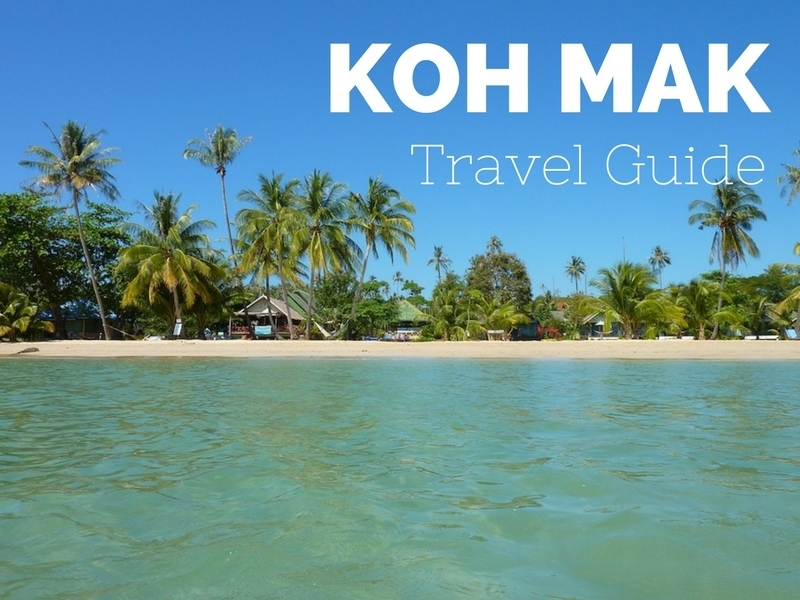 Finally, if you’ve read this far then you’re obviously interested in visiting Koh Mak. However, the island does have a reputation for being home to some vicious sandflies and the occasional Box Jellyfish. Paradise can be dangerous. Sandflies like quiet beaches where they can lay their eggs and not get distrubed by people walking on the sand or resorts raking and cleaning the sand. So they love undeveloped beaches and islands such as Koh Mak. Not everyone reacts badly to their bits, most people don’t. But if you are one of the unlucky ones then you’ll be covered in itchy red spots after a day on the beach. Box Jellyfish can be deadly and are usually found further south in the Gulf of Thailand – for example near Samui, Koh Tao, Koh Pa Ngan. But several people have been badly stung by Box Jellyfish whilst swimming off Koh Mak, so care is needed. Many resorts now have jellyfish nets to provide safe areas for people to swim. And on the beaches you will see ‘Vinegar Stations’, red poles which contain a bottle of vinegar. This is the essential initial treatment for a Box Jellyfish sting. to put on any stings. As yet, there haven’t been any confirmed sightings of Box Jellyfish off Koh Chang’s beaches.